American manned Mars lander. Study 1952. The first design for a manned Mars lander based on engineering analysis. 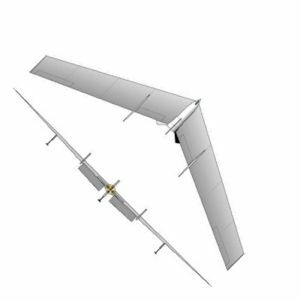 The enormous glider would have a wingspan of 153 m, and land on Mars horizontally either on skis, skids, or wheels on a prepared runway. Status: Study 1952. Payload: 12,000 kg (26,000 lb). Thrust: 1,960.00 kN (440,620 lbf). Gross mass: 200,000 kg (440,000 lb). Unfuelled mass: 75,000 kg (165,000 lb). Specific impulse: 297 s. Height: 22.00 m (72.00 ft). Diameter: 4.70 m (15.40 ft). Span: 153.00 m (501.00 ft). The fuselage, which formed the ascent stage, would then be winched vertically for the return to the fleet of mother ships in Mars orbit after 400 days on the surface. There were two kinds of landing boats. The first sent to the surface from Mars orbit would separate from the Cargo Ship in a 1000 km altitude circular equatorial orbit. The 200 metric ton thrust engine would fire for 17.2 seconds in a 173 m/s deorbit burn, setting the perigee of the descent ellipse at 155 km. The re-entry calculations were based on the Martian atmosphere having a surface pressure 0.084 bar (ten times more than the actual figure that would only become known in 1965). The long gliding re-entry, on immense wings of 2810 sq m area, would last for 86 minutes and extend over 12,655 km, over half way around the planet. The glider had the cross range to reach any point on the Martian surface, from the equator to the polar ice caps. Peak heating during re-entry would be 649 Kelvin, and maximum g-forces would be only 0.12. The glider would become subsonic at 39 km altitude, giving it plenty of time to select a suitable landing spot. It would make a horizontal landing on skis on one of the polar ice caps. This was a one-way trip -- the crew of the first landing boat had no means of return to Mars orbit. Instead of an ascent stage, the glider's payload was 125 metric tons of pressurized habitat/crawlers. The crew of the glider would travel 6500 km in 80 days in their Mars crawlers to the Martian equator, where a base and landing strip were set up. Presumably this was a worst-case scenario - if a suitable landing site nearer the planned base could be found, the first landing boat would be targeted there rather than the ice caps. The two remaining landing boats would touch down on wheeled landing gear at the prepared strip. The fuselages of these gliders acted as ascent stages that provided the means for return to the expedition's spacecraft in Mars orbit. After the landing, the fuselages would be pivoted upwards, ready to lift-off in case an emergency departure was required. The equatorial orbit of the expedition fleet meant that launch opportunities were available every 2 hours and 26 minutes. 50 of the expedition's 70 crew would be sent to the surface on the three landing boats. They would spend 400 days exploring the surface of Mars, living in inflatable quarters, and making long surveys of the surface away from the base in the crawlers. At the appropriate time, the crew would lift-off in the two ascent vehicles and rendezvous with the seven passenger ships in orbit. The ascent stages would have a launch mass of 138 metric tons. The burn into an elliptical transfer orbit would require a delta-V of 3700 m/s and 118 metric tons of propellant. The burn would take 147 seconds, placing the stage in a 125 km x 1000 km equatorial transfer orbit. The circularization burn near the fleet of passenger ships would be 180 m/s and require 1.8 metric tons of propellant. Transfer of the 50 astronauts and the 5 metric tons of material each ship would have returned from the surface would be done between the ascent vehicles and the passenger ships using the fleet's 3.5 metric ton space boats. The ascent stage, abandoned in Mars orbit, would have an empty mass of 19 metric tons. Crew Size: 17. Spacecraft delta v: 4,100 m/s (13,400 ft/sec). Family: Mars lander. People: von Braun. Country: USA. Spacecraft: Von Braun Mars Expedition - 1952. Propellants: Nitric acid/Hydrazine. Bibliography: 373, 49, 591. Mars 1952 lander, showing how ascent stage is positioned for lift-off, using the flying wing descent stage as a platform.